At the University, Cacibaopil had access for the first time, to the Spanish Chronicles, such as the books by Bartolomée Las Casas, and others that documented the incredible brutality of the Conquistadors against the Taino. Weeping from shock at historical details he had never heard before, his personal mission to rescue, preserve, and restore his Taino heritage was born. Cacibaopil began a grass roots movement to bring cultural awareness and increase public knowledge of his Taino heritage through education and public presentations. His untiring work, as lecturer, teacher, and voice of this indigenous population throughout the private and public sector, attracted small groups of Taino descendants from around the Island of Puerto Rico, who were inspired to become part of this restoration movement. The pueblo of Guatúcu was founded in 1992 as a registered nonprofit corporation in the Department of State of Puerto Rico, and incorporated as The Concilio Guatu Ma-cu A Boriken, Inc. in 2000. El Concilio Taino received Federal nonprofit recognition (501C3) in 2007, with a mission to bring Taino cultural awareness and increase public knowledge throughout the island of Puerto Rico and abroad, through education, including the revelation of the true Taino history, and the sharing of customs, language, areytos (ceremonial dance), music and song, and craftwork. Today, The Concilio's pueblo includes members across Puerto Rico, the Dominican Republic, United States, and Europe. Leader of El Concilio Taino since before its founding, Cacibaopil was elected Cacike (Chief), in Taino tradition, by the women of the Pueblo in 2004. Cacibaopil's Taino blood was scientifically confirmed by the breakthrough research of Dr. Juan Carlos Martinez Cruzado (University of Puerto Rico-Mayaguez, Year 2000) that documented for the first time, the Amerindian mtDNA of the Taino of Boriken. The Cacike's Taino Mitochondrial DNA is Haplogroup-C, whose origins are the Arawak (Ingneri) ancestors of the Taino who originated from the border of the Orinoco River in the Amazons of Venezuela. Cacike Cacibaopil Martin D. Veguilla is an official Taino consultant for the Puerto Rican government's Institute of Puerto Rican Culture (I.C.P.). 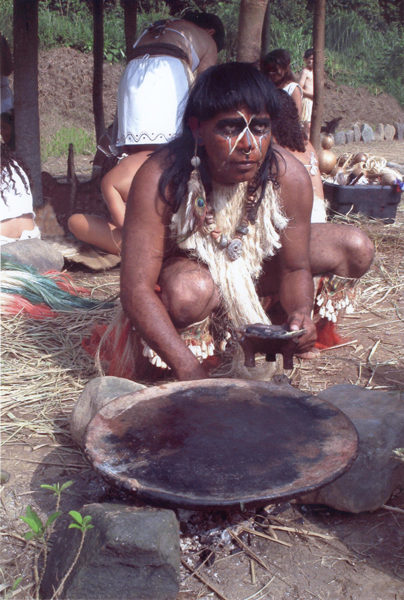 Before becoming Chief, the Cacike devoted much time to the creation of replicas of ancient Taino pottery and earthenware using traditional open-flame fire methods, a talent that brought him near-annual awards and recognitions, from entities such as the Governor's Office (Puerto Rico), the National Endowment, the Institute of Puerto Rican Culture and others. Today, Cacibaopil's prize is knowing that, thanks to the efforts and dedication of his Taino pueblo, there is a new generation growing who will never know life without their rich Taino traditions, or the depth of their spirituality. El Concilio Guatu-ma-cu A Borikén, Inc. es una corporación sin fines de lucro (501C3), registrada en el Departamento de Estado de Puerto Rico, adscritos en el Instituto de Cultura Puertorriqueña (ICRP) y respaldada por Fomento Económico y Turismo de Puerto Rico. Su generosa donación/ayuda/contribución será deducible de impuestos y nos permite continuar nuestra misión.